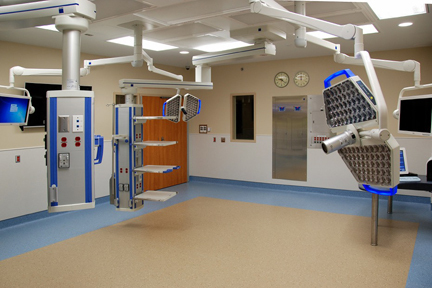 O&G Industries, Connecticut’s largest privately-held construction company, recently completed the renovation and expansion of Operating Room 1 at Charlotte Hungerford Hospital in Torrington, Connecticut. O&G acted as the General Contractor and self-performed work on the project which included demolition, framing, drywall and taping, ceiling modifications and the installation of millwork and finishes. Precautions were taken to completely separate the construction zone from the four adjacent operating rooms which were active throughout construction. O&G maintained a “clean, quiet and safe” work environment with the construction of temporary walls to isolate the construction zone and control dust; the use of negative air pressure to confine airborne matter; and sealed buggies to transport debris and materials through the hospital as needed. HEPA-vacuums were also utilized by workers and on equipment exiting the construction zone. O&G joined Project Architect Moser Pilon Nelson to complete the renovation and expansion of Operating Room 1, which is the latest in a series of successful infrastructure projects completed at Charlotte Hungerford. Operating Room 1 was turned over to Hospital officials in the Fall of 2015.